The political tensions between the two families mean that the relationship between the two has to be approached carefully. The press declare the romance to be something like Romeo and Juliet, but much happier, as the couple ultimately reunited formerly warring families AND lived. As a bonus, even though he can never reign in Hanover, Ernst August still has some legal royal standing: he's the heir to the titles of the Duke of Brunswick (a German title) and the Duke of Cumberland (a British title). 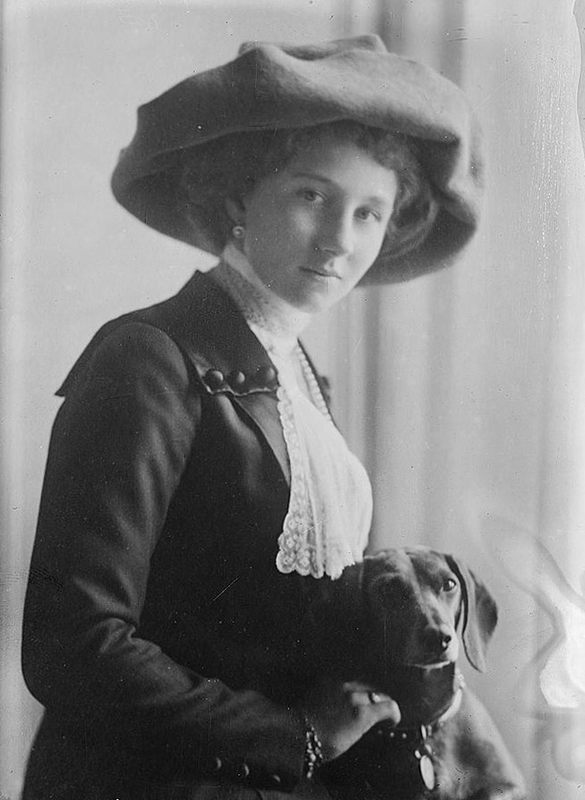 The kaiser's daughter would marry a fellow royal, not a pretender. 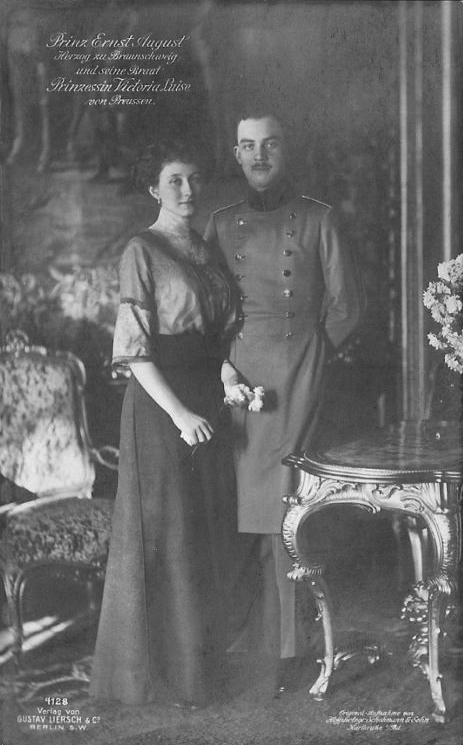 1913: With the politics of the match settled, Ernst August and Victoria Louise become engaged. 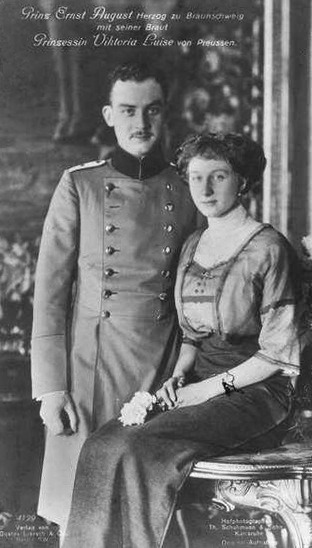 They couldn't have known it at the time, but their wedding will be one of the last great gatherings of royals in Europe before the outbreak of World War I. More than a thousand people attended the celebrations, including George V and Mary of the United Kingdom (who were both cousins of the bride and the groom), as well as Czar Nicholas II of Russia. Such a grand event -- the wedding of the only daughter of the ruler of an empire -- required significant wedding presents. 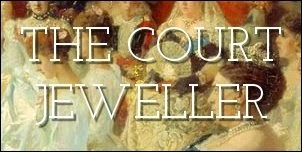 Wilhelm and Dona commission the court jeweller, Koch, to make a new tiara for their daughter. The tiara, shaped like a small kokoshnik, features a number of popular tiara designs: a laurel wreath, a meander, and a pendant drop set en tremblant. The entire piece is constructed of diamonds made in platinum. In honor of Victoria Louise's family, the piece is called the Prussian Tiara. A few months after the wedding, Ernst August succeeds to the Brunswick dukedom, and Victoria Louise, now the Duchess of Brunswick, takes the tiara with her to her new home. 1914: World War I breaks out in response to the assassination of Archduke Franz Ferdinand, heir to the twin thrones of Austria-Hungary. In response to Franz Ferdinand's murder, Austria-Hungary declared war on Serbia -- and then, based on various treaties, other nations were forced to join in. Germany, ruled by Victoria Louise's father, was an ally of Austria-Hungary. During the war, Ernst August rises to the rank of major-general in the German army. 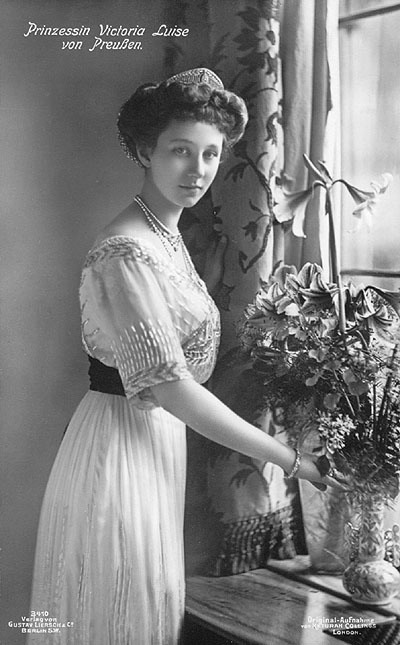 1917: Victoria Louise gives birth to her third child and only daughter, Princess Friederike. At birth, Friederike is both a princess of Hanover and a princess of Great Britain and Ireland. However, only a few months after she was born, the British parliament passed the Titles Deprivation Act, stripping all British titles from those German royals who sided with the Central Powers during the war. Ernst August's British titles, including the Cumberland dukedom, were officially removed two years later. A year later, with the end of the war, he loses his German titles too, including the Brunswick dukedom. 1936: Friederike is in Berlin with her family attending the infamous 1936 Olympics. Also present in Germany is Prince Paul of Greece, whose mother, Sophie, was Kaiser Wilhelm's sister. Paul is the heir to the Greek throne, as his brother, King George II of the Hellenes, has no children. Friederike and Paul fall in love, and that summer, she accepts his proposal of marriage, although their engagement is not officially announced until the next year. 1938: Paul and Friederike are married in Athens. 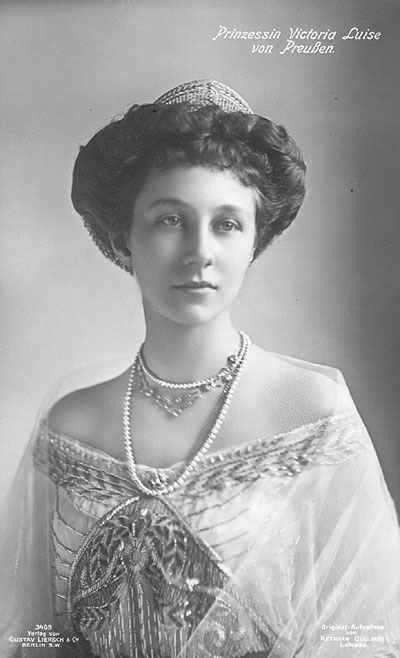 As a wedding gift, Victoria Louise gives her daughter the Prussian Tiara. The laurel wreath and meander (or Greek key) motifs are perfectly suited for a new Greek princess. She wears the tiara for an official portrait with her new husband. Ten months later, Friederike gives birth to her first child: a daughter, Princess Sophia of Greece and Denmark. She is named after her German paternal grandmother, Sophie of Prussia. 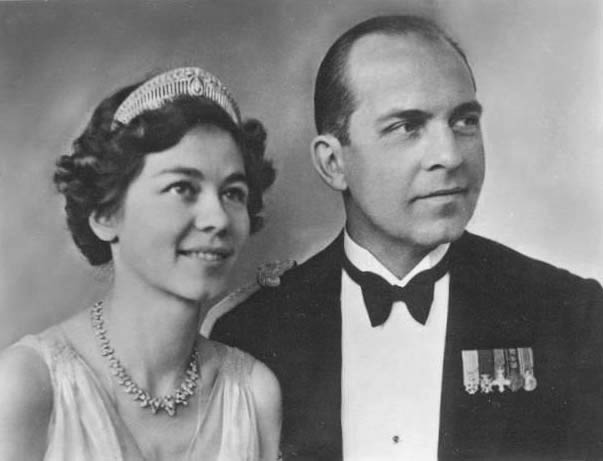 1947: After years of uncertainty and exile, Paul and Friederike become King and Queen of the Hellenes. The Prussian Tiara now belongs to a reigning queen consort. 1954: Fond of matchmaking, Queen Friederike organizes a cruise through the Greek islands and invites a number of young royals along. There, Princess Sophia meets Infante Juan Carlos of Spain. The Spanish royal family is in exile following the country's civil war, but Juan Carlos is the son of the man who would be Spain's king, the Count of Barcelona. 1961: King Paul and Queen Friederike announce Princess Sophia's engagement to Juan Carlos. After her wedding, Sophia will make two significant changes. She switches the spelling of her name to the Spanish "Sofia," and she converts from Greek Orthodoxy to Roman Catholicism. 1969: Generalissimo Franco, who has decided to skip over the Count of Barcelona and make Infante Juan Carlos the heir to the Spanish throne, gives Juan Carlos and Sofia a new official title: Prince and Princess of Spain. The titles were reportedly Sofia's suggestion. 1975: Franco dies, and Juan Carlos and Sofia become King and Queen of Spain. For the second time, the Prussian Tiara is owned by a reigning queen consort. Even so, the tiara is one of the smallest in Sofia's collection, and she often wears larger tiaras, including the Mellerio Shell Tiara, the Spanish Floral Tiara, and other pieces from the Spanish royal collection. 1985: Sofia lends the Prussian Tiara to her younger daughter, Infanta Cristina, for a state banquet honoring President and Mrs. Reagan of the United States. 1988: Cristina borrows the tiara again to wear at a state banquet for Queen Elizabeth II of the United Kingdom. 1994: Infanta Elena, eldest daughter of King Juan Carlos and Queen Sofia, borrows the Prussian Tiara at a state banquet for the Belgian royal family. 2004: Queen Sofia's only son, Prince Felipe, marries Spanish journalist Letizia Ortiz Rocasolano in Madrid. The tradition of the Prussian Tiara as a bridal diadem extends to another generation when Sofia lends it to her new daughter-in-law to wear on her wedding day. 2004: Now Princess of Asturias, Letizia wears the Prussian Tiara at a state banquet for the President of Peru. 2004: In September, Letizia wears the tiara for a third time in a year at a state banquet for the Czech president. 2005: Letizia borrows the tiara again for a state banquet for the President of Hungary. 2007: Sofia lends the tiara to Letizia for a state banquet honoring the Slovakian president. 2008: Letizia wears the tiara at a state dinner for the President of Mexico. 2009: Letizia wears the Prussian Tiara at a February gala dinner for the President of Argentina. 2009: The Prussian Tiara is Letizia's choice for an April state banquet for the President of India. 2009: Less than a week later, the Spanish royals welcome President Sarkozy of France to Madrid for a state visit, and Letizia borrows the Prussian Tiara again for the state banquet. 2009: In October, Letizia wears the tiara at a state dinner for the President of Lebanon. 2009: In December, Letizia wears the tiara for the fifth time in a year, at a state banquet for the President of Vietnam. 2011: Letizia wears the tiara at a gala banquet for the President of Chile in March; this is also, I believe, the most recent time the tiara was seen in public. Read more about all of the Spanish royal tiaras over here!